In this article, we look at the difficulties in creating comprehensive, up-to-date Mainframe configuration information, what this means to your organisation, and some tools that can help. What do your Mainframe systems look like? You could answer that they're a couple of black refrigerator sized boxes. Or you could go into more detail, like "three z/OS LPARs in a Parallel Sysplex, each running one IMS, one DB2 and a couple of CICS regions". Keep going into more detail, and you're quickly going to run out of information. For example, what DB2 tables do you have, and what applications use them? Technical staff like your Systems Programmers, Applications Programmers and DBAs will have some of this information, but their knowledge will be focused on their area of speciality. So it's no surprise that most organisations don't have a comprehensive, complete, up-to-date picture of their Mainframe configuration. But is this important? And if it is, how do you create one? 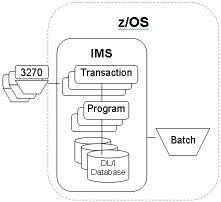 A single IMS subsystem would have pre-defined transactions, programs and databases. The relationship between these was also pre-defined. IMS transactions were generally accessed via 3270 terminals or batch. It's a lot more complicated isn't it? 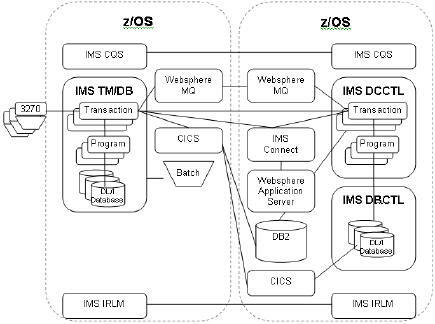 Different IMS region types, Websphere MQ, IMS Connect, DB2 and the IMSPlex infrastructure all complicate your picture. Mainframes also have a different problem to smaller distributed platforms - the number of resources. For example, DB2 subsystems can have hundreds of thousands of tables, views, tablespaces and indexes. Finding out all this information for all of your Mainframe systems (not just IMS) is a Herculean task. You may already have some, but is it complete, or up-to-date? Many different groups in your organisation may have some of the picture, but not all of it, and not all the detail you need. But what is even harder is the task of determining the relationships between them. What applications use a particular DB2 table? Do any CICS transactions call IMS transactions? Do You Need a Mainframe Picture? Moving Forward - Without configuration information, moving your Mainframe systems forward to meet new issues and challenges becomes harder, not to mention riskier. If you change your Websphere MQ system, what other systems could be affected? If you move CICS resources to another z/OS system, what else needs to be changed? In fact change management without configuration knowledge becomes more difficult and less effective. Determining Impact - Configuration information can also help you calculate the impact of outages. If CICS transaction X is unavailable, what does it affect? Problems with a business application can be quickly narrowed down to the individual Mainframe resource. So finding the right technical person to fix a problem is faster. It enables the business impact of scheduled (and unscheduled) outages to be quickly determined. Management reporting becomes clearer, as Mainframe availability and performance information can be quickly related to business functions. Tivoli Business Systems Manager and BMC Event and Impact Management are two products you can use for this. An application for you to add, delete and maintain the information. A way to present your information. For Mainframe users, these may appear more attractive to other CMDB products as they are able to connect to other Mainframe products to automatically receive configuration data. IBM Tivoli CCMDB can get data from Tivoli products such as Netview and Tivoli Business Systems Manager. It can also discover z/OS resources using a Discovery Library Adapter (DLA) for z/OS. BMC Discovery for z/OS automatically populates CMDB products with discovered z/OS resources. The upcoming CICS TS 4.1 provides a facility to send CICS configuration data to a CMDB. These products will automatically discovery most of your z/OS components. They also provide some (but not all) of your relationship information, like which DB2 databases belong to which DB2 subsystems. Using these products regularly ensures you have up-to-date information. However these tools won't give you everything. You're not going to get away from the fact that a lot of your information needs to be entered and updated manually, and often. Convincing your staff to do this is going to be as hard as getting your teenage children to cleanup their rooms. One interesting software product that may help here is Novell's myCMDB product. This uses social networking technology similar to Facebook to make it easier (and more fun) for teams to maintain configuration information. Managing Mainframe infrastructure is a complex task. This isn't going to get any easier as Mainframe applications talk more with other applications - both on and off the Mainframe. Having accurate, comprehensive, up-to-date information on your Mainframe configuration is a big step to keeping this under control. CMDBs and other associated tools go a long way to making this happen.